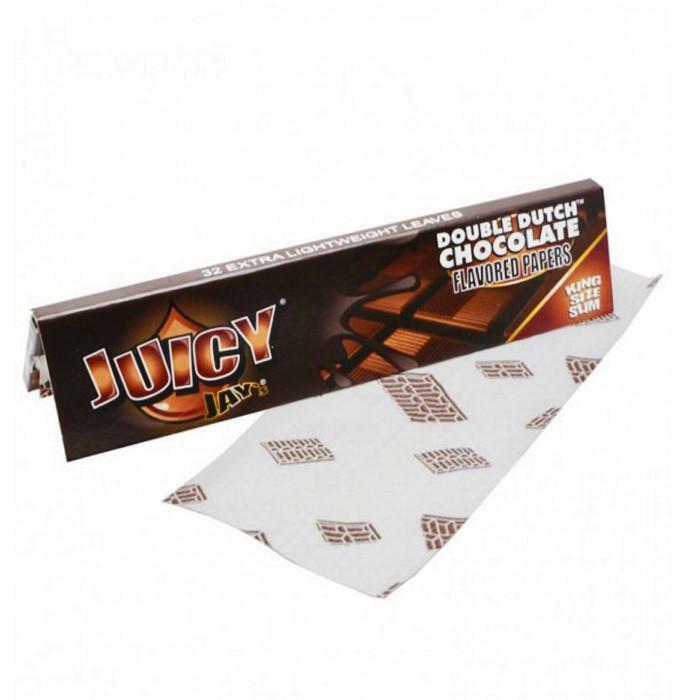 Juicy Jays Double Dutch Chocolate Flavour Kingsize Slim Rolling Papers are infused with a rich and velvety chocolate flavour. Roll your chocolate flavoured paper for a truly unique taste sensation of double dutch layered chocolate. To maintain the flavour throughout the paper they use a Triple- Dipped Flavouring System and Soy-based ink with natural sugar gum to make Juicy Jay's flavoured papers so mouth watering. A paper slip folded in with the leaves reminds you when you're running low. Did you know that the average human has about 10,000 taste buds; however, they’re not all on the tongue. Some are under the tongue, some are on the inside of the cheeks, some are on the roof of the mouth. Some can even be found on the lips, that’s why Juicy Papers and wraps taste so amazingly good. Juicy has 3X more flavor than our bland competitors!